Great article in Cheers Magazine featuring some of my tips in creating signature cocktails! Don’t you just love the smell of fresh mint? Whether it’s in a cocktail, mixed into a fruit salsa, or growing in the garden, that fresh scent and taste hits the spot. Have you ever tried growing mint in your garden? If you have, you know it is amazingly easy and actually will take over if you’re not careful, but what’s better than a fresh handful of mint leaves whenever you want? And there are so many varieties to choose from. Peppermint leaves are wonderful dried and steeped in hot water to make a simple, d’lish tea. And there are so many tasty varieties – Chocolate Mint, Pineapple Mint, Lemon Mint, Orange Mint… even Lime Mint that is perfect when muddled into mojitos! Also, for you cat lovers out there, remember catnip is a mint too. So careful planting mint, unless you want to attract every kitty in a quarter mile! 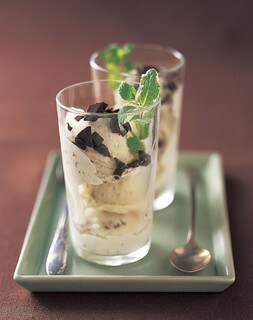 As the weather gets warmer, cool off with my Fresh Mint Ice Cream. Nothing beats nibbling on fresh made ice cream under a shady tree! With the Kentucky Derby coming up mint juleps are on the horizon… oh yea! If you plan on hosting a Derby party, try making a batch of my Spiked Iced Tea Punch. Fresh mint pairs well with white whiskey, black tea, fresh juices, and brown sugar. Punch is the perfect party cocktail! For a more-spiked interpretation, let guests add a little more whiskey to their individual drinks. For summertime sipping add in a few slices of fresh peach or nectarine. For a demo on how to make this, check out this episode of Kathy Casey’s Liquid Kitchen. Poke the cloves into the orange, then cut it into 3 slices. Put the orange slices, mint, and tea bags in a heatproof pitcher or bowl. Add the boiling water, let steep for 1 hour, then remove the tea bags. Add the ice water, juices, and brown sugar. Stir until the sugar is dissolved, add the whisky, and chill until ready to serve. Serve in ice-filled glasses. Garnish as desired. Recipe adapted from Kathy Casey Sips & Apps. Spirts, wine, and beer are a major industry in the Northwest, but not as often as we should, do we celebrate the spirited women of this industry. As part of Seattle Beer Week (May 7th – 17th), The Pike Brewing Company will be hosting the 4th annual Women in Beer event on May 11th. This event celebrates the historic role women have had in the beer industry and their influence on the current craft beer movement. Did you know? Historically women were the ones who brewed and sold beer. In fact in the Middle Ages, it was often nuns! And there’s more! The Museum of History & Industry’s (MOHAI) current exhibition American Spirits: The Rise and Fall of Prohibition is featuring a cool lecture series (aptly titled History on the Rocks), includes a Women of Temperance and Tenacity seminar that I am co-presenting on Thursday, May 28th from 6:00pm-8:00pm. I’ll be sharing a Liquid Kitchen signature cocktail for the seminar, which highlights Washington women’s roles in the alcohol industry pre- and post-prohibition. Make sure to get your tickets soon! 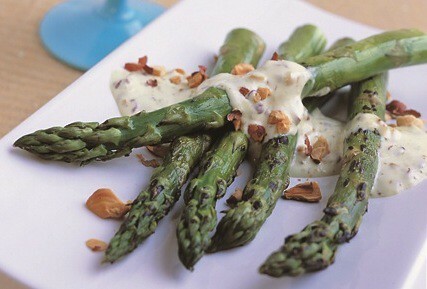 Asparagus is a sure sign of spring. Looking for new ways to cook it? Well, I love it steamed, grilled, roasted, or sautéed. Just give it a quick rinse and then snap off the fibrous ends at their “natural break.” The ends can be saved for veggie stock or added to your compost. Asparagus is also great to incorporate into a weekend brunch, in an easy egg scramble with shrimp and herby boursin garlic cheese – Yum! If you’ve got the grill fired up, just toss asparagus spears in a little olive oil and seasoning, lightly grill and serve with oh-so-Northwest, homemade, toasted Hazelnut Aioli. Perfect for smearing, slathering, or dipping grilled asparagus into. And don’t think you must go through a huge ordeal to make pickled asparagus! I’ve got a great recipe for Quick Overnight Refrigerator Pickled Asparagus – it’s a snap! Wash asparagus and with a paring knife trim off the bottom 3 inches (the woody tough part) and discard. Meanwhile, get coals going in grill — you want to grill the asparagus over pretty hot coals. Place the hazelnuts on a baking sheet and toast in oven for about 6 – 8 minutes, or until golden. When cool enough to handle, put hazelnuts in a clean, non-fuzzy dishtowel and rub as much skin off hazelnuts as comes off easily. Set aside until needed. In a food processor add the hazelnuts, sugar, garlic, lemon juice, mustard, egg yolks and salt. Process until smooth. In a measuring cup mix together the olive and hazelnut oils. With food processor running, SLOWLY drizzle in the oils; the drizzle should be about the width of a spaghetti strand. The mixture will slowly begin to emulsify, forming a mayonnaise-like consistency. (Don’t add the oil too fast, or the mixture will break!) When all the oil has been added, pulse in the water. Store refrigerated until ready to use. May be made up to 3 days in advance. Place asparagus on a large plate and lightly brush with a little olive oil. Place asparagus over very hot coals and grill for about 1 minute on each side to mark asparagus nicely and cook until just done. Sprinkle with a little salt if desired. Great served hot or warm dipped into or smeared with aioli — I like it served cold, too! In a large bowl whisk together the eggs and water until very foamy; season as desired with salt and pepper and set aside. In a large, non-stick skillet heat the olive oil over medium-high heat until hot. Add the asparagus and cook, stirring often, until barely tender, about 2 minutes. Add in the egg mixture and move the eggs around the pan with a spoon or spatula, turning them as necessary until they are three-quarters cooked, about 1 – 2 minutes, and have just started to thicken. Makes 1 large jar or about 20 pieces. Wash asparagus and with a paring knife trim off the bottom 3 inches (the woody tough part) and discard. Place asparagus in a canning jar standing up or in a glass bread pan or other non-corrosive container. The asparagus should fit tightly in. Set jar or container on a dish towel in a draft-free place in the kitchen. Place the pickling brine ingredients in a non-aluminum saucepan over high heat. Bring to a hard rolling boil and then immediately ladle brine with the spices over asparagus, being sure to cover the asparagus and poking down the spears if needed. Cover with a lid or plastic wrap. Let cool to room temperature, then refrigerate. Let pickle for at least overnight before eating. Pickled asparagus will last refrigerated up to 2 weeks. Looking for your signature Easter Brunch cocktail? The delicious & frothy Strawberry Silver Gin Fizz is a sure crowd pleaser and oh-so-spring looking! Delightfully pink and bright flavored, this drink is flash blended then finished with soda water for a fun and unique addition to your morning get-together. To make things easier, you can pre-batch the strawberries, sugar, gin, lemon, and egg white and keep refrigerated until ready to blend with the ice. In a large glass measuring cup combine the strawberries and the powdered sugar. Let sit for 10 minutes. 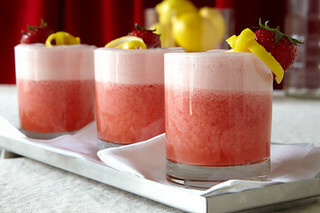 Combine the macerated strawberries, gin, lemon juice, egg whites and ice in a high powered blender. Blend on high speed until smooth and all ice has been blended in. Add soda water to blender. Divide fizz between chilled glasses. Garnish with strawberries and lemon twists. Check out today’s article “Riding the Trendy Tea Wave” in Nation’s Restaurant News all about the exploding tea-flavored drink trends. From specialty iced tea to tea lattes to tea cocktails… tea is everywhere! Featuring tips and ideas on how to zest up your tea-based drinks! “The Devil is in the Details” – love it! Thanks to Wisconsin State Journal for featuring recipes and tips from D’Lish Deviled Eggs!